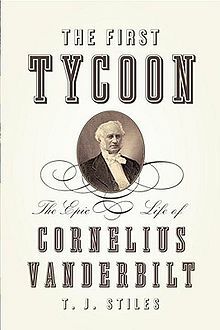 The First Tycoon: The Epic Life of Cornelius Vanderbilt by T.J. Stiles — I chose this book because this biography won the Pulitzer Prize in 2010. The challenge for this biography is the story of the man and the story of the man in the times. 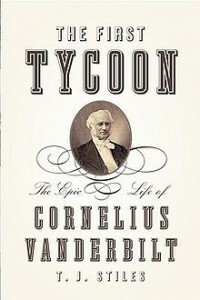 Vanderbilt lived during the dramatic change in America as the country moved from small owner businesses to large corporations. Vanderbilt created monopolies in business, but initially he was breaking up the legally sanctioned monopolies of government created monopolies in transportation — ferries, short-haul and passenger ships and later railroads. At times, he angered the established power base by charging less, which in the end ran the competitors out. He also operated during the growth of the corporation as a legal person. Also how wealthy was Vanderbilt? Stiles writes that if Vanderbilt had liquidated his estate in 1876, his last full year of life, he would have received $1 for every $9 in existence. At the time the book was written, Bill Gates III was the richest man in the world. If his holding had been liquidated, he would have received $1 for every $20 in existence. I also feel that even though Gates is worth so much more than most, we all live so much better than those at the time of Vanderbilt. We all have gained from better nutrition, medicine and our lives feel richer thanks to computers, music, books, planes, trains and cars, etc. Vanderbilt had trains, but that’s not the same as a car. The Innovator’s Dilemma: When New Technologies Cause Great Firms to Fail by Clayton Christensen — His story of how new technologies lead to the undoing of some companies and success for others is fascinating. It’s a challenge many technology companies face, and I’ve seen how daily newspapers have struggled. Christensen lays out reasons how companies can try to weather these changes, but in the end few do. But that change is necessary, it’s better than trying to stop the innovation. Reading Vanderbilt’s disruption of his economy and the challenges existing companies have from new technologies were an interesting paradox.